This stunning trio of keepsake boxes will make a huge style impact on your room. 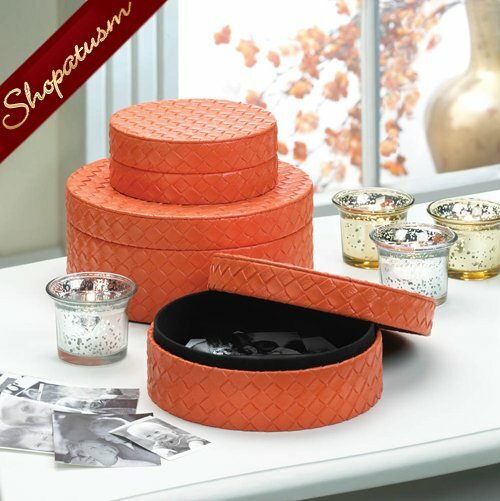 Finished in tangerine faux leather with a woven appearance, these three varying-sized boxes can hold a variety of jewelry or other treasures. Item Weight: 1.9 lbs. Large: 7 1/8 inch x 7 1/8 inch x 3 inch high; medium: 6 inch x 6 inch x 2 3/8 inch high; small: 4 3/4 inch x 4 3/4 inch x 1 3/4 inch high. MDF wood, PVC and inner felt lining.